Take a chance to discover the marvellous landscapes and old architecture of the Transcarpathian region. You will spend an unforgettable time in a sunny mountain region with a lot of forests, parks and ancient castles preserved till nowadays. 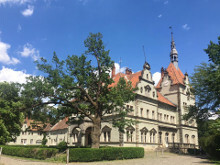 You will be able to visit 3 most beautiful and popular castles of the region and enjoy the beauty of the local landscapes together with the tasting of national Transcarpathian-Hungarian cuisine and discover the traditions and the culture of thew local people. 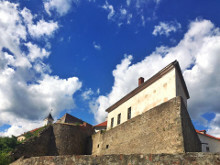 You will also make beautiful photos with the panorama of the cities from 2 castles that are located on the hills in Mukachevo and Uzhgorod towns. Group cost - 500 UAH per person (every week). This price includes transportation + excursion during the tour in Ukrainian/Russian language). You could hire an German-speaking guide at extra 20 EURO / per hour. Entrance tickets to the castles - 35 UAH per person. 07:30 - departure from Lviv city. 09:00 - coffee-break in Stryi town. Trip to the palace of Shenborns in Chynadiyevo. The castle is perfectly preserved. In 1890 in place of a wooden house there was built the castle, consisting of 12 entrances (by number of months in the year), 52 rooms (by number of weeks in the year), 365 windows (by number of days in the year). Tour to Mukachevo castle "Palanok" (XIV-XVIII centuries). No matter from what side you are arriving in the city, the castle is visible, as it is located on the hill. Lunch in ethno-cafe in Uzhgorod town. 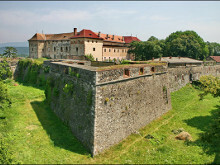 Tour to Uzhgorod castle (XV-XVIII centuries). Actually the palace stands on the edge of the steep northern slope of Castle Hill. This massive two-storey building in the Renaissance style follows the outline of the fortress. The castle is surrounded by the beautiful park, where you will be able to have a rest and observe the panorama of Uzhgorod town. Returning back to Lviv at around 21:30.